Architects know how vital it is to be seen in the right light. In order to do this, many firms must be able to show outstanding work that stands out against the competition while being able to convey a solid sense of knowledge, talent, and principle at the same time. Studio RED Architects was built on the idea of creating something different and better – something that truly stands out. This architectural firm from Houston, Texas is fueled by creating designs that are “outside the box” while offering practical solutions, hands-on involvement, and outstanding service. The architects at Studio RED wouldn’t call themselves ego-driven, rather, they are only driven to place clients first and foremost in mind. 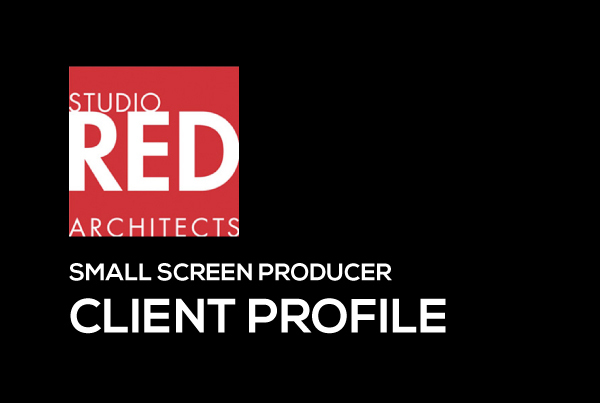 Small Screen Producer understood that for Studio RED, there needed to be a way for the firm to stand out from all the other architectural firms in the area and make it undoubtedly the first choice for new projects. With this challenge, we put together a total web presence made of several digital media marketing components that establish credibility and present a strong reputation for providing quality architecture. First, take a look at the website that features a rotating interactive homepage banner, navigable image categories, and custom video production for a quick introduction about the firm. On the right, take a look at the innovative navigation bar, different from your typical top navigation bar filled with featured categories that highlight the firm’s years of service, knowledge and talent. View the firms portfolio by category. Each category includes a video on the firm’s particular approach for the structure, a photo gallery, and a past client testimonial. A big piece Small Screen Producer made sure to include was Studio RED’s own video channel, which provides an incredible visual representation of Studio RED’s impeccable talent through panorama images and custom video production. To increase website traffic, find target clients, and help the firm stand out against the competition, we search engine optimized the site and implemented a comprehensive content marketing strategy that builds online visibility on all search engines. The content marketing strategy consists of press releases, custom on-location video, social media, blog, and free downloads to attract and captivate audiences.